Would you like to see an increase in productivity, employee job satisfaction? A decrease in absenteeism? Are your employees under a lot of stress? In-office massage programs can make all the difference. Massage Therapy is a proven way to decrease stress while increasing our feelings of well-being, and ability to focus. 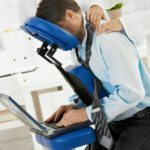 Your Health Span has an onsite corporate massage program that will increase morale, building a healthier, happier and more productive workforce. 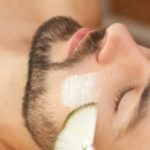 More and more companies are realizing that massage is not just a perk but an effective and cost-effective way to improve morale and increase productivity. We need a private space, large enough for our chair massage therapists and their equipment, a board or meeting room is usually perfect. Just as long as it is quiet and relatively private so everyone gets maximum results. We arrive with everything we need, all the employees need is to leave their desks for 15-20 minutes while they receive their massage. The employees pay for it themselves-usually taking advantage of direct billing through their insurance coverage. Our cost works out to 85/hour so if we do 15 min, appointments it is just 20$ per employee. Using Trigger Point therapy to relieve stubborn knots. Call us today to tailor a stress reduction plan for your office!